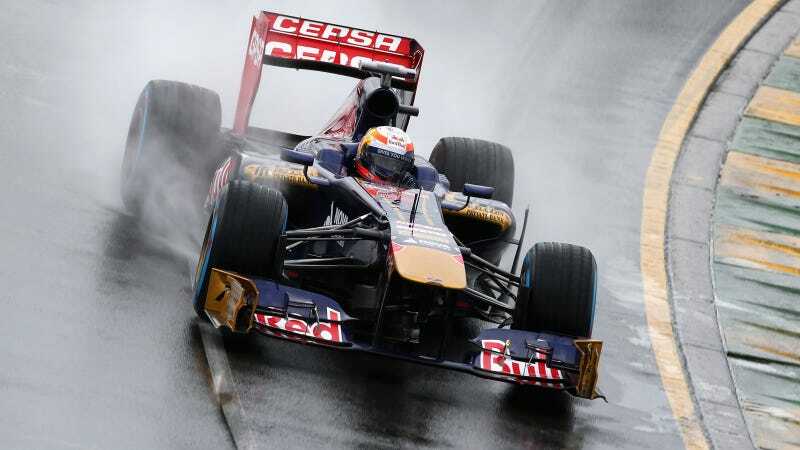 The opening of the 2013 Formula One season got off to a lackluster start in Australia, as rainstorms caused FIA officials to push the second and third qualifying rounds to just a few hours before Sunday's race. Q1 was completed Saturday in Australian local time, but the rain delays meant it was getting too dark to run Q2 and Q3, according to the Associated Press. Rather than base the starting positions on Q1, race officials will hold Q2 and Q3 on Sunday. NBC says that qualifying will resume tonight at 8 p.m. EST. We're working to confirm whether that will be shown on TV live. The race will start six hours later. UPDATE: The official F1 on NBC twitter account has finally clarified how this is going to work tonight. (Give them a break, they're new at this.) Qualifying will be tape delayed tonight.